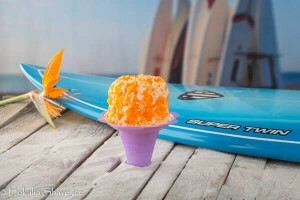 Hokulia Shave Ice is an ice-based dessert made by shaving a block of ice, adding our own delicious flavors and a scoop of Utah's own Farr's ice cream. Top that with a "Sno Cap"(condensed milk) and you're in Hawaiian heaven! Even though it is made with shaved ice, it is called "shave ice," not "shaved ice" by Hawaiians. Why shave instead of crushed ice? Shaving produces a very fine ice that appears snow-like. This extremely fine texture allows syrups that are added to it to be absorbed by the ice rather than simply surrounding it. The combination of our perfect shave ice (there's magic in our ice!) and our proprietary flavors imported from Hawaii with a scoop of our award winning ice cream sets us apart. Hokulia has its own magical taste – in fact, it's all about the Taste of Aloha! 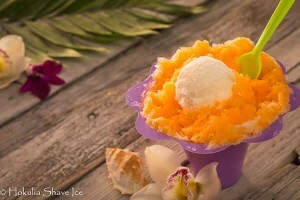 Discover: The Hokulia Shave Ice business ADVANTAGE! Discover: How to be your own boss with a fun, low cost set-up and a GREAT ROI business. Discover: Our new in-line store concept ideally located in a 1500 sq ft space. Discover: Inline store inside of America's Largest Retailer. Learn about our low rent and our great locations available. This is a business opportunity that is as remarkable as Hokulia's shave ice taste! If you qualify to become a Hokulia franchisee we will help you become a successful and happy entrepreneur with a great product, low investment, superior return on that investment; PLUS the opportunity to work in a fun, people-pleasing environment that makes customers' wishes come true while making your own dreams a reality! These are the qualities that make the Hokulia business opportunity, like our amazing products, irresistible. 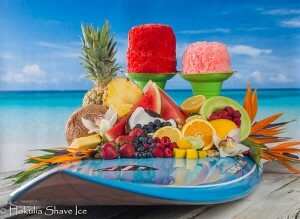 You will be working with a company that brings you the most authentic Hawaiian Shave Ice product on the mainland. Since Hokulia Shave Ice has been in operation, our sales have skyrocketed each and every year. In addition, we are backed by the Farr's Ice Cream Company. Farr's has been a leader in the ice and ice cream industry for more than 90 years. They are a company with the experience, expertise and most importantly the financial strength that will help you to reach your financial dreams and earn your just desserts (pun intended). We call it "Tastes of Hawaii" to be in one of our Hokulia stores watching the smiles on our customers' faces and seeing the eyes of our young customers open wide and light up when we hand them their tasty Hokulia treat! You can see kids bouncing from their cars to our store, and they aren't alone. Hokulia appeals to all ages, because it's a feel-good treat in a colorful, inviting environment that's also a great social gathering place for family and friends. We're looking for franchise owners who are outgoing and have sales, marketing, and/or management experience and who are results oriented. One who can build relationships, lead a team, and has the motivation to excel! You must have a minimum of $90k in liquid capital. Our model can be run either full-time or absentee with good management in place. Yes, I want to receive a maximum of 1 text message per day. Message and data rates may apply. I can opt out at any time by replying STOP. Yes, I’d like more info on how to use my retirement funds (401k, etc.) to buy a franchise (Min. $50k required). We will only use your information to deliver it to the specific businesses you have requested.